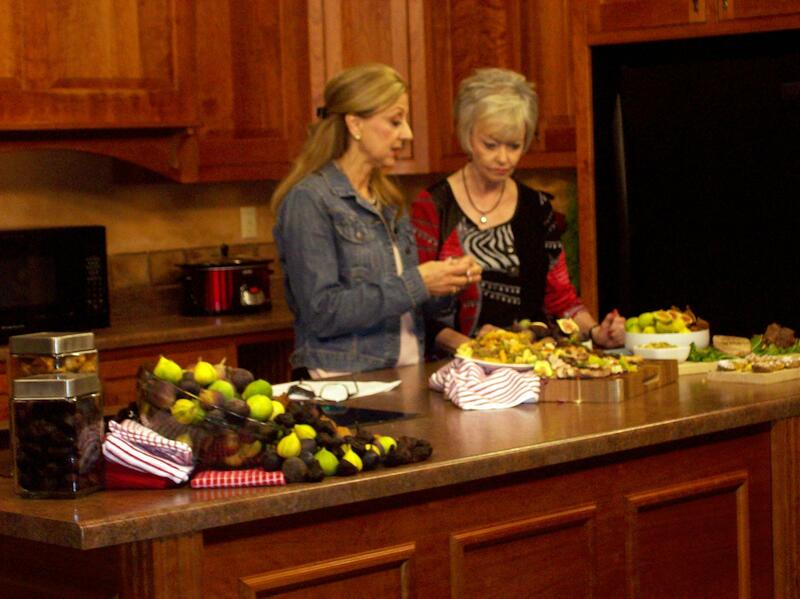 Karla Stockli (second photo) and Kris Caputo (top photo) came to Portales to tape lots of recipes featuring California figs. They also discussed how figs have become an important ingredient for food bloggers because of their versatility. I hope you'll enjoy trying some of the recipes they shared with us. 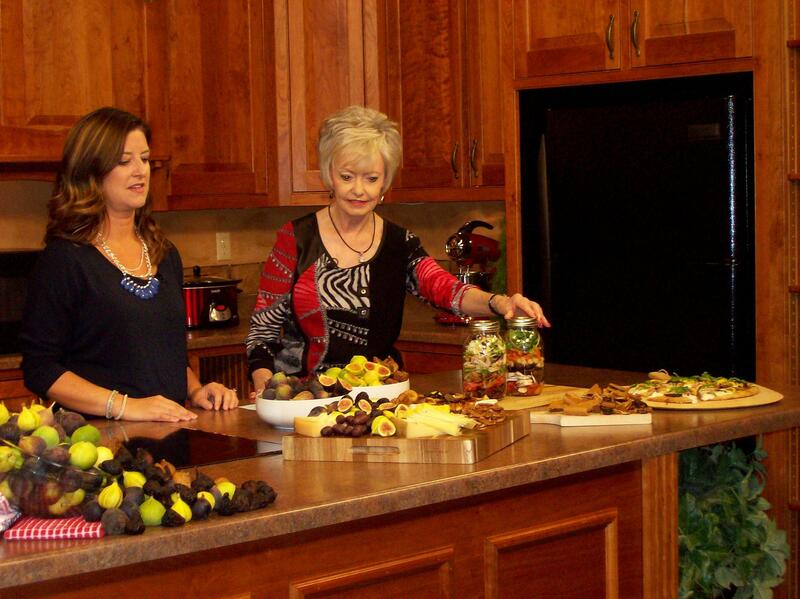 Kris Caputo represented the California Fig Advisory Board when she came to tape some segments for "Creative Living with Sheryl Borden." Karla Stockli is the Chief Executive Officer for the California Fig Advisory Board in Fresno, CA. Heat butter in large saucepan and cook shallots until caramelized. Stir in molasses and vinegar; season to taste with salt and pepper. Continue to cook and stir until all liquid has been absorbed. Set aside to cool. Preheat pizza stone or heavy baking pan in 500° F oven for 30 minutes or more. Meanwhile, spread figs on sheet pan or tray; drizzle with olive oil and honey, then season with salt and black pepper. Set aside. Then, on 12x12 inch piece of parchment paper with lightly floured rolling pin, roll pizza dough to about 1/4-inch thick. Brush generously with olive oil and spread Caramelized Shallots over all. Arrange sliced figs about 1/2 inch apart on top of shallots and season lightly with salt and black pepper. Sprinkle goat cheese evenly over all. Transfer pizza to preheated stone and bake, 10-15 minutes at 500° F or until cheese and edge of crust are lightly browned. Remove from oven and transfer to cutting board; let stand and cool slightly. Then, cut into wedges, and garnish with sliced prosciutto, parmesan and arugula. Serves: 9. Peel the carrots. Put the carrots in broad skillet so the carrots lay flat. Add enough water to cover the carrots. Add a pinch of salt. Bring the water to a boil, then simmer until the carrots are tender. Carefully pour off all of the water. Return the skillet to the heat. Add the butter to the skillet. Add the minced figs, garlic and ginger. Slowly sauté the carrots with the figs and the ginger until the ingredients are lightly caramelized. Add the chopped cilantro, salt and pepper, and lime juice. Quickly stir to wilt the cilantro. Transfer the carrots to a serving platter. Spoon the fig and ginger mixture over the carrots. Garnish with additional cilantro sprigs and serve. Note: Alternatively, slice carrots can be used as well. Serves: 4. Rinse the quinoa under running water. In a pot, combine the rinsed quinoa and the water. Bring the water to a boil, then cover and simmer for about 20 minutes. Remove from heat. Remove the stems from the figs and discard. Thinly slice the figs. Roughly chop the onion and garlic. Wash the kale. Remove any thick ribs and discard. Cut into small pieces. Heat the olive oil in a broad skillet over medium heat. Add the sliced figs, the onion and the garlic. Add the fennel seeds, black pepper and salt. Sauté the mixture until the onions and garlic are lightly cooked. Add the kale and sauté to wilt the kale. Remove from the heat. Allow to cool to room temperature. For the vinaigrette, combine all of the ingredients in a mixing bowl and whip until emulsified and creamy. In a mixing bowl, combine the cooked quinoa and the sautéed fig and kale mixture. Add a few tablespoons of the vinaigrette and toss. Distribute the salad between serving plates or bowls. Sprinkle the chopped nuts over the salad. Garnish with the grated parmesan. Serve the extra vinaigrette on the side. Serves: 2 large servings or 4 smaller servings. In saucepan, combine all jerk sauce ingredients. Bring to a boil, reduce heat and simmer for about 20 minutes or until figs are soft. Set aside to cool. Transfer to a small food processor or blender. Add olive oil and seasonings and process until smooth to make a thick sauce. Store in refrigerator until needed. Preheat oven to 350° F. In large ovenproof skillet, heat olive oil until hot. Sear chicken breasts until lightly browned on both sides. Brush, liberally, with jerk sauce. Bake at 350°F for 25-30 minutes or until chicken reaches 165° F on a meat thermometer. Meanwhile, combine all ingredients for cabbage slaw in a large bowl and toss to mix well. Divide between 4 individual serving plates. Slice each chicken breast into 1/2-inch slices, and arrange on top of cabbage slaw, spooning a dollop of Caribbean Jerk Sauce over each. Garnish with sliced figs. Serves: 4.